In my infinite quest of banana bread experiments... I was feeling overly ambitious (read: overly confident) in the kitchen one day. 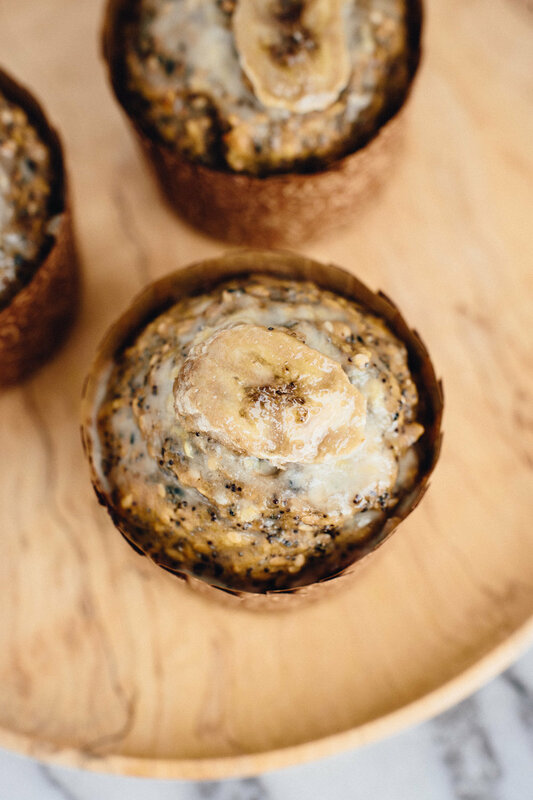 I grabbed a few ripening bananas off the counter, and set off to make a "healthy" baked good that I could justify eating as a balanced breakfast. The only sweetener was said bananas, with a mix favoring more seeds and nuts than flour. Although I wasn't aiming for sweet, I took a bit of one as it was, and they needed a kick of something to just kick it up a notch. Staying true to the seed theme, I whipped up the easiest recipe I'll ever post on here: a Sesame Lemon Glaze. It's quick. It's bright. It's delicious. It has protein, it has vitamin c and, if you're using local honey, it has immune boosting powers. Ok, so maybe that's all reaching a bit on the health side, but bottom line: it's delicious. You'll want to drizzle it over all sorts of baked goods, breakfast bowls, or some fruit. Start by adding only 4 tablespoons of the honey (if crystalized in your pantry, see note below), and juice of one lemon, to integrate the liquid slowly and avoid slopping around. As it becomes a more creamy consistency, continue to add lemon juice, and honey to desired sweetness. If your honey has caramelized, place jar in a pot of warm water, set heat to medium-low and stir until crystals dissolve. The most important thing is to not heat it too much or too quickly, to avoid stripping it of some of it's nutrients, and to not let it cool down too quickly either, to prevent re-crystallization. OPTIONAL - If you want to bring out a nuttier flavor, toast your sesame seeds over a dry large pan stirring constantly over medium low heat until fragrant and lightly brown. DO keep an eye on the seeds, their tiny size can easily get them too toasty! Let cool before next step. Using a food processor, add the sesame seeds and blend them until finely ground, about 30 seconds or so. Once smooth, add salt to taste, processing a few seconds more to incorporate. Store tahini covered in the refrigerator for one month. If it separates over time, that's normal, simply re-stir. There are many tahini options out there. The main thing to look at is whether the sole ingredient is sesame seed, from a single source... as opposed to brands that use a blend of sesame from many places; in that regard, it's awesome if the label says where it's made, rather than where it was packed. Avoid brands containing added salt, oil, sugar, or coloring. Tahini made from unhulled seeds makes for a more bitter, grittier tahini. The darker, more roasted seeds result in smokier, bolder-tasting or even sometimes bitter tahini. If you're feeling splurgy, or lazy, my two favorite brands to have on hand in the pantry are: Seed + Mill, and Soom. Both are organic, offer an unhulled version, made with the "golden standard" of sesame seeds from one single origin: northwest Ethiopia (their seeds known as the white humera variety).